Studies link loneliness and social isolation to health issues such as high blood pressure, poor sleep, dementia, depression and higher mortality rates. (For links to the research, see Five Ways to Improve Quality of Life for the Elderly or Sick). Although Aged Care residents enjoy great care and each other’s company, it doesn’t replace connection with close friends and family. The Konnekt Videophone helps maintain that vital connection. In addition, smiles from their loved ones are contagious, increase happiness, and have a positive impact on quality-of-life. The one-touch screen is incredibly easy to use, promoting greater independence and therefore higher self-esteem. The Konnekt video phone system in his Aged Care Home room has really helped Dad connect better with friends and family. Also, he doesn’t have to remember phone numbers! The simplicity of the system enables him to be more connected to family and friends, reducing his sense of isolation and aloneness. — Wendy Wintersgill, Registered Nurse (RN). One customer’s family took their tablet PC with them on vacation. They were able to call “Grandpa” on his Videophone from anywhere they had Wi-Fi or wireless Internet. They involved him in dinner conversation, took him on a virtual tour of the resort, and — best of all — let him watch his grandchildren play by the pool. Videophone helps families place a parent in respite for the first time, or leave a parent alone at home. Your clients feel better about their decision. They can check on health, signs of loneliness, and be reassured that “Nanny” is smiling and in good care! Providing a high level of care is central to your mission. We’re sure you’re constantly striving to improve your services, stay ahead of industry trends and build your reputation. built in to just your premium rooms. The transition into Aged Care can be challenging. Potential clients — especially short-term respite clients — often visit and interview five or more facilities. Residents fear a loss of connection with the people they love and their surroundings. Families want to be able to SEE that their loved one looks happy and well looked-after. The Konnekt Videophone is a differentiator that speeds your client’s decision, freeing up your time and filling rooms. Satisfied respite clients come back, again and again. One day, they become long-term residents who appreciate your premium service. As little as two weeks of reduced vacancy pays for each Aged Care Home phone. Ask for Konnekt’s ROI Calculator to estimate the return-on-investment for your facility. With Videophones in your games room or shared areas, your Lifestyle Activities Manager can run a regular group activity to entertain residents, connect them to their families and to each other. Konnekt can setup each Videophone for several willing residents to call family and friends (with client approval), and to link residents across sites or between two rooms in one building. The resident permitted to make a Videophone call feels capable/independent and enjoys family time, while other residents in the room also benefit from watching ‘Mavis’ talk face-to-face with her son. If time permits or where there is a strong need for connection, the Lifestyle Coordinator may schedule individual time for family calls. Your Business Development Manager can use the same Videophone while entertaining a prospective client, to promote your innovative facilities and services. Often, a shared or watched Videophone experience is the first step for a resident or client towards renting a unit for their own room. Behavioural problems manifest or worsen when a resident feels lonely or bored: Apathy, waking at night, refusing to cooperate, eating disorders, disturbing other residents, dialing 000 (911) emergency, poor personal hygiene, wandering and asking to “go home”. Forgetting to use glasses, hearing aids or walking aids can lead to accidents. By maintaining a strong bond with family and friends, Videophone reduces social isolation and promotes healthy habits. Happier residents, happier staff! When a daughter or son calls, your staff member probably runs around your facility with a cordless phone, looking for the resident. Konnekt Videophone allows the relative to dial the room directly, and gives the resident ample time to answer. Depending on local policy and with permission, an auto-answer option can also be setup. This allows an authorised caller to check whether the resident is asleep or away from the room without pestering your staff. Conversely, when the resident wants to call her family or friends, Videophone makes it super simple. With just one touch, it tries multiple numbers automatically, so it’s much more likely to connect… and less likely to result in a request to your staff for assistance. During busy times, your staff can attend faster to “nurse-button calls” by calling residents on their Videophones. This may help them prioritize room visits when multiple residents call at the same time. With the client’s permission, your staff can check on residents remotely. Unlike a web-cam, the caller does not “spy” on the resident. The resident’s Videophone rings and, if not answered manually, it is (optionally) auto-answered, with TWO-WAY video and voice. This allows the resident to see who is calling and have a two-way conversation with your nurse or staff member. 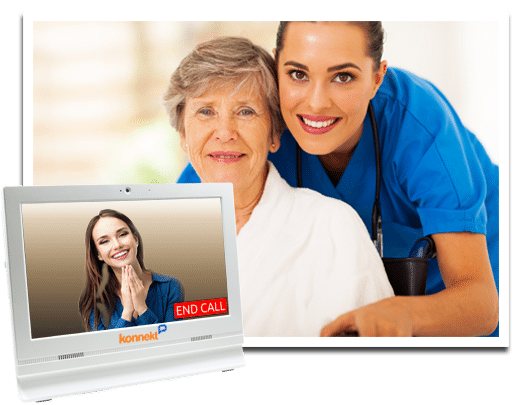 Konnekt provides a Videophone product flyer for your client information pack, and we can assist with demonstrations of our Aged Care Home phone to residents and clients. Contact us to learn how we can help you surprise and delight your clients, overcome their fears, and help you stand out with a premium service – without further loading your busy staff.